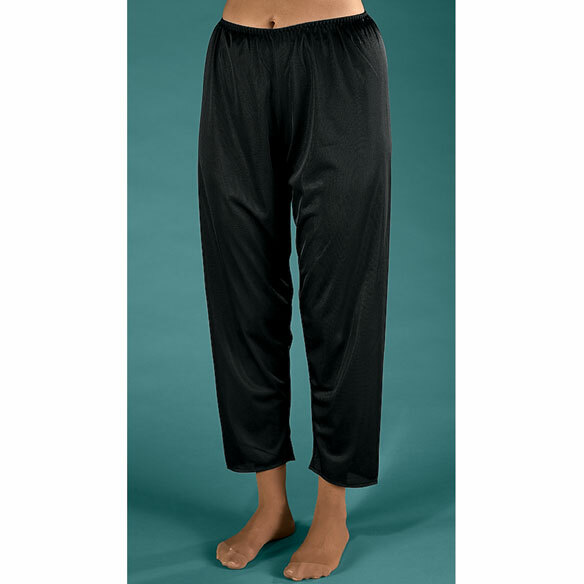 Great for lounging, sleep, under pants! Very Nice!! As a guy who likes the feel feel and look of women's silky underwear, these fit the bill. I bought these to wear under my jeans on cold blustery days, they fill the bill. I'm 5'11", weigh 160 LBS and while they are little bit short, not too short. They feel great and keep me warm. At 9 dollars a piece, they are half what others charge for pants liners. Men and women will find these very suitable. I was looking for a pair of long underwear that would not be heavy or binding for cold blustery days this winter. These are fantastic for that. Except for being a little short, (I'm 6' tall) they are excellent. Not heavy or constricting and keep you warm. They feel nice also, I love these things. Great price too. I recommend them for anyone who is looking for light weight warmth. I do wish they made them in longer inseams though. I know the price was right. However, very disappointed. DO NOT recommend!!! Bought this for my mother. Who was excited when she chose it via the catalog. When she received it; not so thrilled with quality. The cut of these pant liners is really off! They are MUCH too short in the stride. I have bought pant liners for many years & have never gotten any that fit this poorly. They are not too small overall, waist & hips are the correct measurements around, but they are so short in the stride that there is no way I could even sit in them, much less sit comfortably! I am going to return them. I have been diagnosed with Fibromyalgia, & pant liners reduce my pain level. Looking for loose pant liner, these will work. I been looking for this item and couldn't find them and I finally did at Easy Comfort so I ordered it. Needed a black pant slip and this looked comfortable and inexpensive. I purchased pants liners because designers are making pants with see through material. 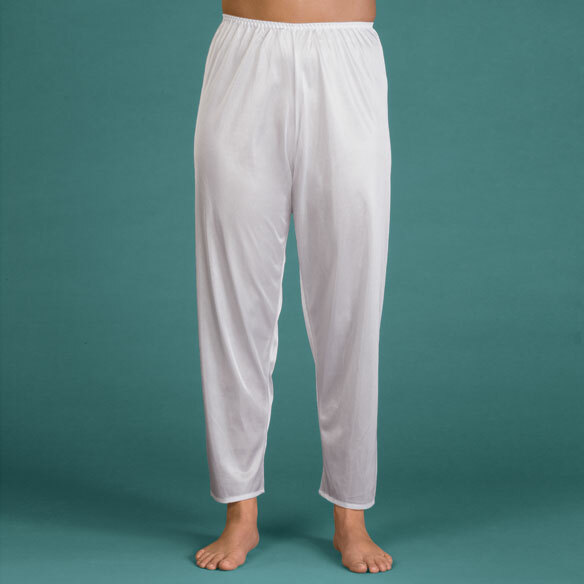 Wanted pants to lounge around in to add to nightgown/ sleepwear options. Nice to wear with a flannel top & bathrobe. Purchased previously and they are great !! Love them !! I like these to wear underneath white slacks. To wear under lightweight and unlined pants. Love to wear these liners under my pants for extra warmth and to protect my sensitive skin from irritation from the pant fabric. Have several....love them...time for more !! Thank You !! Mom loves these... she is always cold & these provide a lightweight, easy to get on layer. All purpose pant liner. Love them..... True to size ! Have many, for lots of days !! My old pant liners are in tatters. They were another brand. I hope this brand works for me. I want to use them as lounge pants in the summer. These are great for comfort, and are light weight. Have 6 pair, need more. Very practical. Thank You !! exactly what I need plus reviews are good for me. BEST ANSWER: Not really. The purpose of the liners is to keep the slacks from being see through. I like them very much under white or very light yellow slacks. not transparent, but translucent. order up in size, as product runs smaller than expected. Thanks Betty. Some slips however are not see thru and some are. I wanted to wear for exercise class with a tunic long top but not if you could see my legs thru the slip. No it would be revealing. I can see all my waffle skin thru. I bought to go under thin white pants but I can still see the pockets thru them.sirry I mislead you. Thanks to Betty. I now have a very clear idea thanks to you and several others. Do these streach at all? BEST ANSWER: I have not found that they stretch. But even if they did, I believe they would return to shape once laundered. They are very flexible and comfortable. Feel just like a slip for pants. A bit. The material is very similar to that of a slip.